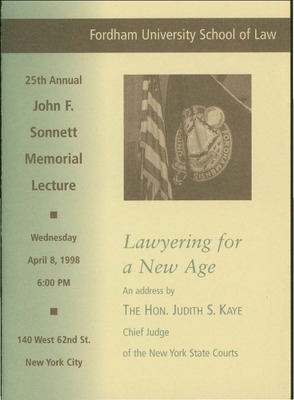 Program from "Lawyering for a New Age" by the Honorable Judith S. Kaye, Chief Judge of the New York State Court of Appeals (1993-2008), regarding her efforts to make the New York State Courts more efficient and accessible. 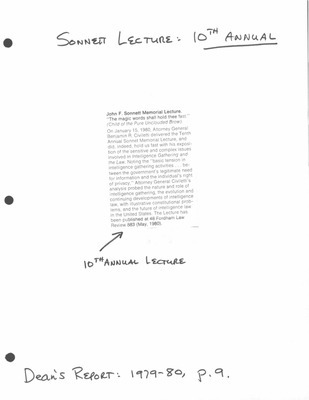 A list of lectures in the John F. Sonnett Memorial Lectures Series organized by topic. Document has handwritten notes. 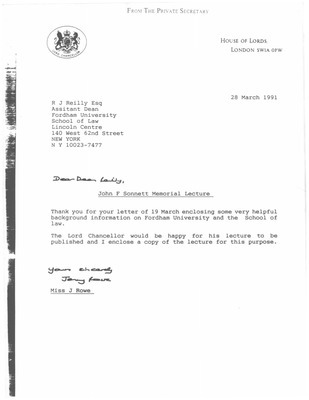 Invitation to "The Right to Life and Death" by Chief Justice Liam Hamilton of the Supreme Court of Ireland (1994-2000). 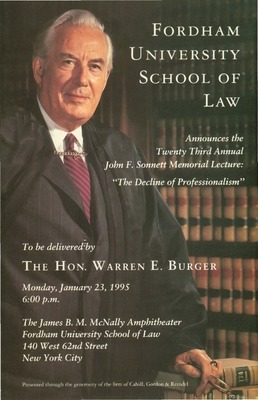 Invitation to "The Decline of Professionalism" by Chief Justice Warren E. Burger of the United States Supreme Court (1969-1986). 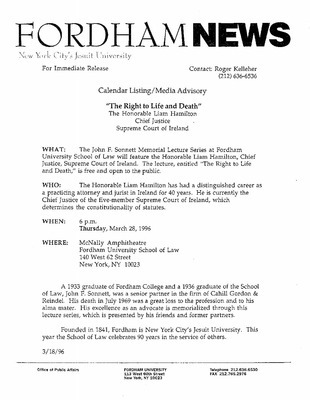 Invitation to the Twentieth Annual John F. Sonnett Memorial Lecture Series: The Advocate: Should He Speak or Write? Invitation to "The Advocate: Should He Speak or Write?" by Lord Chancellor James Mackay of Great Britain (1987-1997). 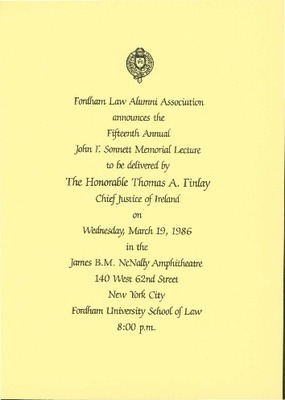 Letter from Principal Private Secretary Jennifer Rowe of the Lord Chancellor's Department (1990-1993) to Assistant Dean Robert J. Reilly of Fordham University School of Law regarding "The Advocate: Should He Speak or Write?" 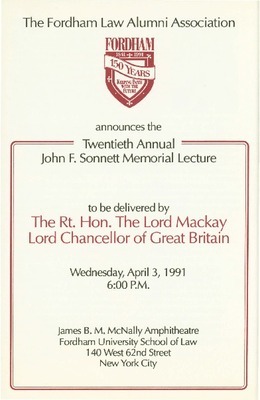 by Lord Chancellor James Mackay of Great Britain (1987-1997). 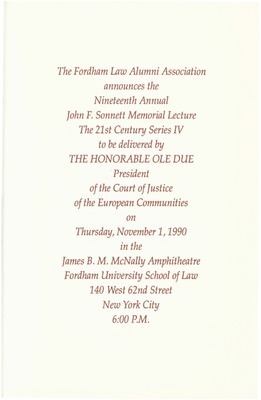 Program for Legal Remedies Against the Council's Failure to Act by Judge Ole Due, President of the European Court of Justice (1988-1994). 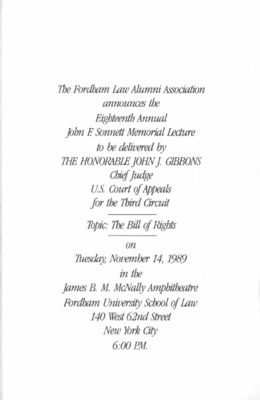 Program for the 18th Annual John F. Sonnett Memorial Lecture Series: Bill of Rights by Judge John J. Gibbons, Chief Judge of the U.S. Court of Appeals for the Third Circuit (1987-1990). 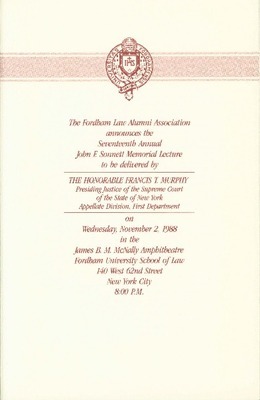 Program for the 17th Annual John F. Sonnett Memorial Lecture Series: The Invisible Prince by Judge Francis T. Murphy, Presiding Judge of the Supreme Court of the State of New York Appellate Division, First Department (1977-1997). 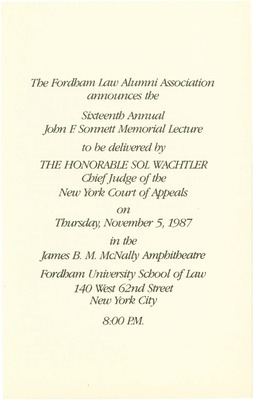 Invitation to the Sixteenth Annual John F. Sonnett Memorial Lecture Series by Judge Sol Wachtler of the New York Court of Appeals (1985-1992). 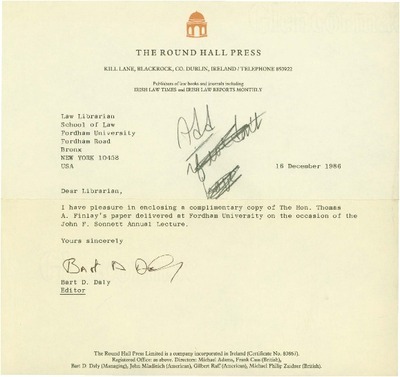 Letter from Bart D. Daly, editor of the Round Hall Press to a Fordham School of Law Librarian regarding a enclosed "complementary copy of the Honorable Thomas A. Finlay's paper" which can be found under Articles. Document includes handwritten notes. 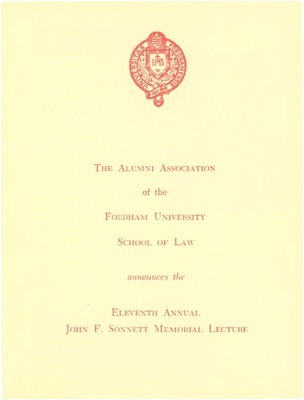 Invitation to the Fifteenth Annual John F. Sonnett Memorial Lecture Series: Advocacy Has It a Future? Invitation to "Advocacy: Has It a Future?" by Chief Justice Thomas A. Finlay of the Supreme Court of Ireland (1985-1994). 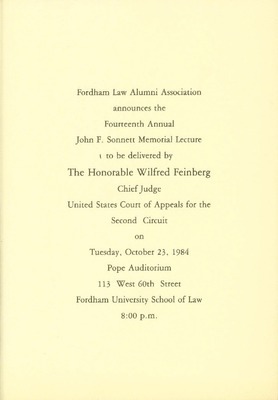 Invitation to "The Office of Chief Judge of a Federal Court of Appeals" by Chief Judge Wilfred Feinberg of the United States Court of Appeals for the Second Circuit (1980-1988). 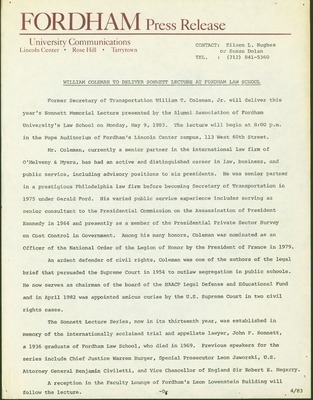 Press release for the Thirteenth Annual John F. Sonnett Memorial Lecture Series, "The Supreme Court of the United States," given by William T. Coleman, partner at O'Melveny & Myers and former United States Secretary of Transportation (1975-1977). 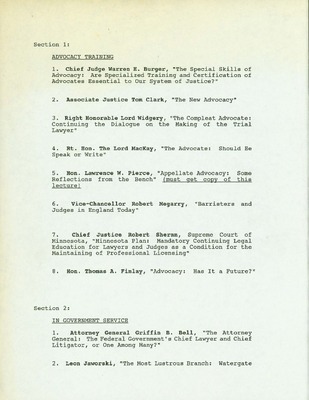 Program from "The Supreme Court of the United States: Managing its Caseload to Achieve its Constitutional Purposes" by William T. Coleman, partner at O'Melveny & Myers LLP and former U.S. Secretary of Transportation (1975-1977), about the size of the Supreme Court's caseload and the resulting repercussions. 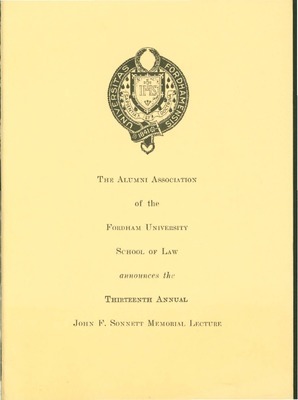 Invitation to "Waste Not, Wait Not: A Consideration of Federal and State Jurisdiction" by Chief Judge Lawrence H. Cooke of the New York Court of Appeals (1979-1984). Dean's Report of the Tenth Annual John F. Sonnett Memorial Lecture Series: Intelligence Gathering and the Law: Conflict or Compatibility? Dean's Report (1979-80) on Intelligence Gathering and the Law: Conflict or Compatibility by Benjamin R. Civiletti, Attorney General of the United States (1979-1981), regarding the sensitivity and complexity of intelligence gathering. 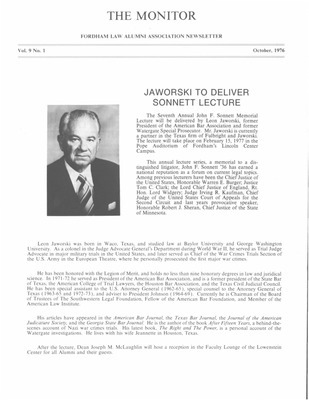 Newsletter by The Monitor about "The Most Lustrous Branch: Watergate and the Judiciary" by Leon Jaworski of Fulbright and Jaworski, former President of the American Bar Association (1971-72) and Watergate Special Prosecutor.